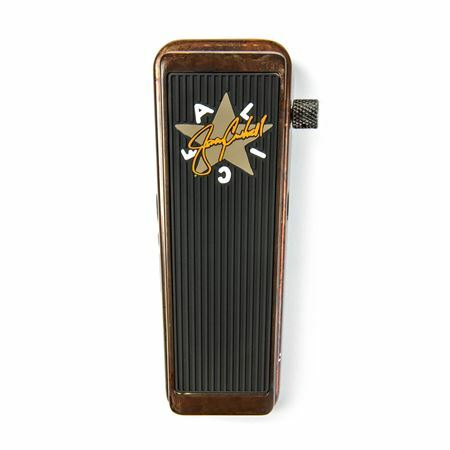 Shop Dunlop JC95 Jerry Cantrell Crybaby Wah Pedal from AMS with 0% Interest Payment Plans and Free Shipping. If you are looking for a quality Wah pedal, Dunlop Jerry Cantrell Crybaby Wah Pedal is it! Jerry Cantrell is one of the most influential guitarists to come out of the Seattle rock scene. His epic riffs and searing tone have been the driving force behind Alice in Chains since the late 80's. Cantrell's melancholy wah-drenched melodies in modern classics like "Man in the Box" and "The Rooster" left an indelible mark on a generation of guitarists. Jerry favored wah-wahs with a wider, darker response, and Dunlop has painstakingly replicated that moody sound to create his signature pedal. Dunlop's Jerry Cantrell Crybaby Wah Pedal is costume voiced for tight, punchy heel-down tone and a rugged side-control knob lets you fine tune the toe-down frequency. With it's antique, oxidized 'road worn" brass casting and custom Alice in Chains tread, the Jerry Cantrell Crybaby Wah Pedal is one pedal that looks as great as it sounds. It's nice to have this option available to any crybaby user. Simple turn of the knob and you can get whatever sound your seeking. Rock on! Looks awesome and sounds great...would recommend! Love, love this pedal !! Also love " Alice in Chains "
It rocks! Love it.! Alice in chains. Keep the albums. Coming !!!!! Would buy again if lost or stolen. Sounds perfect to me. Had to repair right our of the box... BOO!!! Once if fixed the pot that was dangling around, it worked and sounded great. Jerry Cantrell - King Of Tone !! its Dunlop , so yeah , very well made. so far , very depndable. and i anticipate it being so for a very long time. yes , it is basically just a modified GCB95 Original Crybaby as most "signature" models are. however , with 1 simple but very effective twist. shrill & ear-piercing or warm , dark & round. or like a stock GCB95. distressed ??? so i guess just the way Mr. Cantrell wanted it. it really is 1 of the most unique looking of all the Crybabys.